Even in his wildest dreams Jackie Chan wouldn’t have thought that, with his movies, he’s inspiring someone sitting in a remote town of UP, India to take up a sport he doesn’t even know the name of. 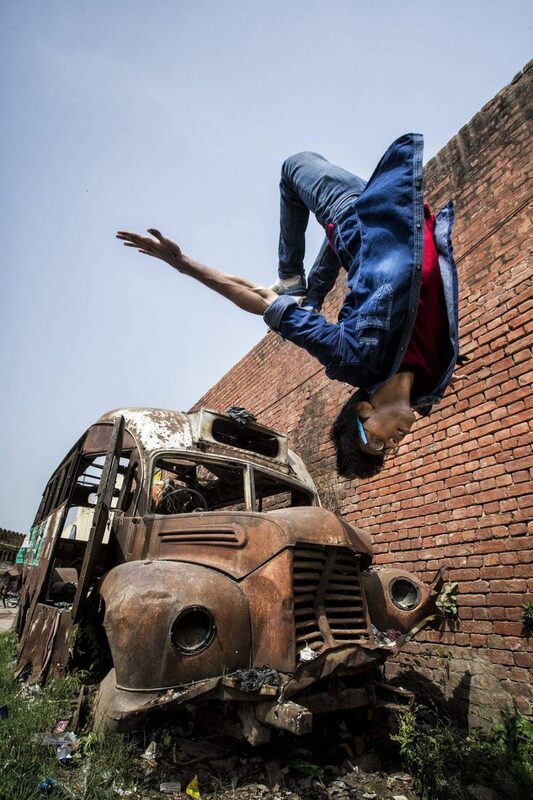 Born and brought up in Rampur, Mujahid started parkour and free running in 2007. It was his friend who told him that all the jumping, swinging, climbing, hanging, he’s been doing from one roof to another is called Parkour. Some of Mujahid’s friends also showed interest and together they have probably built the best free running team in India. They gained recognition a couple of years back at Red Bull Indus Trail where renowned Kuwaiti parkour athlete Mohammed Al Attar (Mo) picked Mujahid as one of the most promising participants from the event. While we complain about living in urban jungles, parkour enthusiasts like Mujahid are making the most use of urban spaces. I asked Mujahid, what makes him continue a sport which is not so common and chances of injuries are high, to which he said, “Parkour to me means freedom as there are no rules. You make your own rules, push yourself and get to know yourself better”. What makes the sport so interesting is that it not only takes a lot of strength, training and discipline but also creativity as each individual has his or her own perspective of the space they want to play at. Honestly, I didn’t even think we had a serious parkour scene in India. And probably I wouldn’t have even bothered to read about it and talk to Mujahid, had I not been curious until I saw the boys of Rampur in the adidas ad. I’m always impressed and thank the brands when they choose to showcase real people and real stories. I have attached the ad as well as a video of the boys I found on youtube who are inspiring to say the least. The amazing talent from the small town like Rampur, it’s great energy, great inspiration.